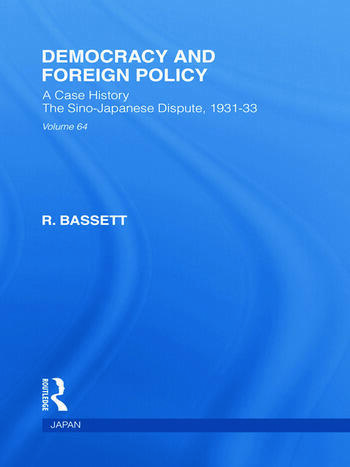 The Sino-Japanese crisis of 1931-33 provides effective illustrations of wider themes in British Foreign Policy. It might even be said that the general pattern of opinion in the UK at the time was to be reproduced in subsequent crises. The Manchurian problem and the controversies which it provoked give invaluable clues to an understanding of later developments. Introduction. Prologue. Part 1. 1. The League Council and Manchuria. 2.The "Sanctions" Controversy: First Stage Part 2: The Second Phase 3. Anglo-American Co-operation 4. The Stimson Note 5. The Letter to Senator Borah 6. British Opinion on the Borah Letter 7. The Sanctions Legend 8. Shanghai and Sanctions – 1 9. Shanghai and Sanctions – 2 10. Shanghai and Sanctions – 3 Part 3: The Third Phase 11. Waiting for the Lytton Report Part IV: The Last Phase 12. The Lytton Report 13. "What Matsuoka Said" 14. The "Forensic Defence" of Japan 15. The Breakdown of Conciliation 16. The Assembly’s Report 17. The Arms Embargo Campaign 18. The Debate of February 27th, 1933 19. The Embargo 20. To the Tangku Truce Part 5: Post-Amistice 21. The After Years Part 6: Commentary 22. The Parties and the Dispute 23. "Collective Action" by Great Britain 24. "Within Their Power" 25. The Government’s Policy Appendix. Index.